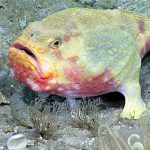 A new species of Polylepion was recorded from deep reefs off the coast of Roatan, Honduras, by researchers from the University of Washington and the Smithsonian aboard the Idabel submersible. Wrasses are primarily a shallow-water group. 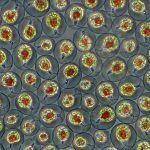 The vast majority of this family’s biodiversity can be encountered in the upper 100 feet or so of the world’s tropical and temperate marine ecosystems, but there are a few interesting exceptions to this. There are some Cirrhilabrus and “Halichoeres” that manage to occur quite far down, but the most notable deepwater labrids are those from a small lineage, closely related to the Bodianus hogfishes, that have made their home exclusively in mesophotic and rariphotic depths… Decodon and Polylepion Unless you’re a serious fish nerd, you’ve likely never heard of either of these genera. Decodon is the better known of the two, though only barely. 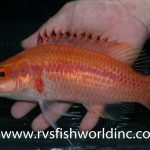 Specimens of the Caribbean’s Red Hogfish (D. puellaris) have been snatched up via submersible and offered semi-regularly through the aquarium trade (obviously, with a considerable price tag). Three other species from this genus can be found in scattered parts of the Indo-Pacific, but their preference for reefs below 100 meters makes these VERY rarely collected. And then there’s Polylepion, which is likely the deepest dwelling group of wrasses out there. The genus presently has just two species, the Pink Hogfish (P. cruentum), found only in the Eastern Pacific, and the Yellowstripe Hogfish, restricted to Hawaii and Japan. 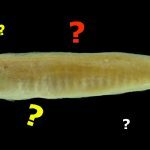 Both occur from about 300-1000 feet deep, but it’s been known for a while now that this genus actually has a third species, still undescribed, lurking at similar depths in the Caribbean. Referred to as the Red-banded Wrasse, this beautiful fish is easily identified by the prominent red saddles spaced across its back. 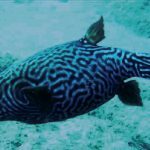 Until now, we’ve had only a few photographs documenting this species, but a new video shared by ichthyologist Dr. Luke Tornabene is providing an unprecedented view of this captivating fish. Filmed as part of the Smithsonian Institution’s Deep Reef Observation Project at the popular dive site of Roatán, Honduras aboard the Idabel submersible, this mysterious Polylepion can be seen in stark relief against the desolation of a silted, coral-less reef. Save for a few vase-like glass sponges and the odd goby (Palatogobius grandoculus), there appears to be little else in the way of macroscopic life in this ecosystem. Hopefully soon we’ll see this mysterious apex predator of the rariphotic given a proper scientific name.